Volunteers from the Environmentalist Foundation of India (EFI) have desilted and widened the Seekana Channel, a stream which will carry excess water from the Seekana pond to the Adyar river. CHENNAI: Residents of Mudichur, which was among the worst-hit areas of 2015 Chennai floods, have one less overflowing pond to worry about as the monsoon approaches. Volunteers from the Environmentalist Foundation of India (EFI) have desilted and widened the Seekana Channel, a stream which will carry excess water from the Seekana pond to the Adyar river. Volunteers took 28 days to finish de-silting/widening of the 820-metre-long channel. The project was completed as planned, just before Independence Day. Volunteers have increased the water carrying capacity of the channel by 20 per cent after removing two to three feet of silt along the contours of the canal which runs parallel to the outer ring road before it meets the Adyar river. The recent rain was a litmus test for the project. 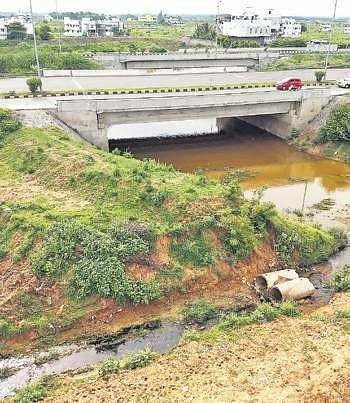 According to locals, the channel served its purpose and drained rainwater into the Adyar river which snakes under the outer ring road near Mudichur. During the de-silting process, volunteers also removed non-biodegradable waste from the channel and also undertook a scientific sampling to understand water and soil types in the area. “Long-term sustainability of this channel serving as a drain would require active participation of residents and zero pollution,” said Krishnamurthy. EFI is set to desilt four other lakes in Mudichur before monsoon.